Since 1982, we have been helping accident victims get fair and just compensation. 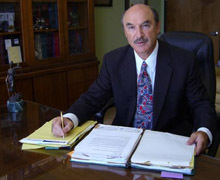 As Personal Injury Attorneys, we serve the Los Angeles area from our offices on Ventura Boulevard in the city of Encino, adjoining Sherman Oaks, Reseda, Tarzana and Van Nuys. Located in the San Fernando Valley, we are freeway-close to all of Los Angeles County and Southern California, serving clients in San Bernardino, Orange County, Riverside, Ventura, San Diego and Santa Barbara. When necessary, we associate and work with attorneys in other states, from Nevada to New York.